Background: Diverse chronic disease arises with aging including cardiac and neurodegenerative disorders. Oxidative stress is considered to be the important cause of aging which can affect various vital organs and lead to a general reduction in physiological functions. The brain is the most sensitive organ towards such oxidative stress due to high oxygen consumption and higher metabolism. Aging of the brain can impair the cognitive skills and memory which lead to the demented condition. The histopathological hallmarks of dementia are a neuronal loss in the forebrain, generation of amyloid β plaque and neurofibrillary tangles. It eventually abolishes the thinking skill and memory. Objective: Thus, dementia is a major public health concern, with economic and social burden, of which occurrence is greatly increasing. There is no cure for dementia, however, only a few approved drugs are available for the management of the demented condition. Hence, there is a need of alternative medicine for effective treatment and management. 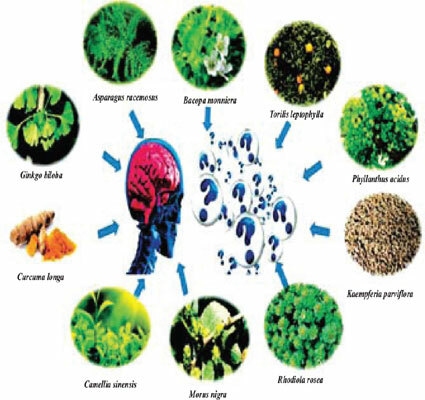 Method: Nowadays, several herbal products have been introduced with their neuroprotective effects, with additional advantages of being low cost, easily available and with fewer side effects. Conclusion: This review represented the pathophysiology of dementia, classification with current therapy and advancement in plant products for their potential neuroprotective properties. Dementia, amyloid β plaque, neurofibrillary tangles, cognition, mechanistic description, herbal products, neuroprotection, Alzheimer's disease.